The magic of ELR is the use of color. Color is how the body communicates on the cellular level. Through the application of color light at targeted acupuncture points, information is fed to the body. This information is delivered directly where it is needed to balance the body and bring your innate beauty to a new level that's beyond any other non-surgical treatment. You'll feel and see the benefits of ELR after the first treatment. Noticeable results generally occur after 3 treatments. Dramatic results after 10. There are nos side effect to ELR, only side benefits! Therefore, You can undergo consecutive treatments to speed results! Take Your Beauty to the Next Level Now! Developed according to the principles of Chinese medicine by Darren Starwynn, O.M.D., Energy Light Rejuvenation works in harmony with the natural energy systems of the body. 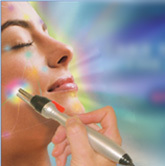 ELR's exclusive combination of Microcurrent and Therapeutic Light and Color (TLC) re-educates facial muscles and addresses the underlying causes of visible aging. This unique, non-invasive, holistic system takes rejuvenation to the next level by providing whole body renewal with results that go to a new level...Youthful, glowing skin AND a relaxed, energized body! Anyone can benefit from ELR treatments. ELR whole body rejuvenation will take your beauty to the next level! Why wait? Extraordinary results are waiting for you right now.